In 1960 Bill Colgan operated a shop with 5 employees doing custom auto and boat upholstery. One day a group of engineers brought him a ragged piece of canvas with sewn-in wooden slats, rubber bands, crude hooks and other miscellaneous innovations. They told him it was a protective cover used by a German OE for road testing new cars and asked him to redesign it. After spending about as much time road testing as sewing, he finalized his design and called it “Steinschlagshutzshulle”. Dissected, the word means, stone/strike/shield, and for short he tagged it “Bra”, pioneering a product category that’s still going strong 50 years later! 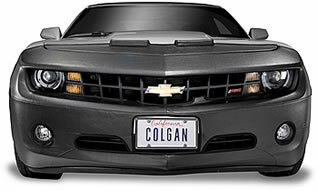 Covercraft acquired Colgan Custom in 2009, committed to continuing the tradition of design and manufacturing excellence Colgan Bra’s are known for – setting standards by which others are measured. Still Made in USA using premium Haartz vinyl, new applications and patterns are added weekly. Double Padding - At critical areas, prevents wear-thru and protects finish. Maximum Protection - 25 oz. flannel-backed vinyl with exclusive Memory Fit and UV resistant top coat. Top/Double Stitch - Strengthens, adds detail and delivers a better body-hugging fit. Backing - Super soft flannel keeps paint scratch free. Vinyl Coated "S" Hooks - Won’t scratch. No Loose Parts - Everything is attached to the bra. Padded Hooks - Flannel padded tabs are double-covered and reinforced. Pre-bent for easy installation. Easy Installation - No tools required. No drilling, no Velcro®. Hooks are pre-bent. Multi-Piece Design - Hood opens, headlights and headlight wipers operate with the bra in place. 1-Piece Original Bra - Full front coverage protection for cars, trucks, vans and sport utilities. Available on early models or new models where a 2-piece would be impractical. 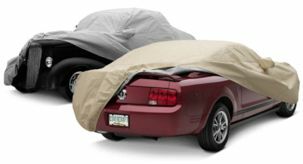 2-Piece Original Bra - Full front coverage protection for cars, trucks, vans and sport utilities. Hood and headlights open and operate freely with bra in place. Sport Bra - Hood piece only from 2-Piece Original Bra for cars, trucks, vans and sport utilities. Hood opens with bra in place. Does not interfere with brush guards, tow hooks and winches. 2-Piece Full Bra - Full front coverage protection with T-Style Hood for trucks, vans and sport utilities. Hood opens with bra in place. T-Style Bra - Hood piece only from 2-Piece Full Bra for trucks, vans and sport utilities. Hood opens with bra in place. Does not interfere with brush guards, tow hooks or winches.